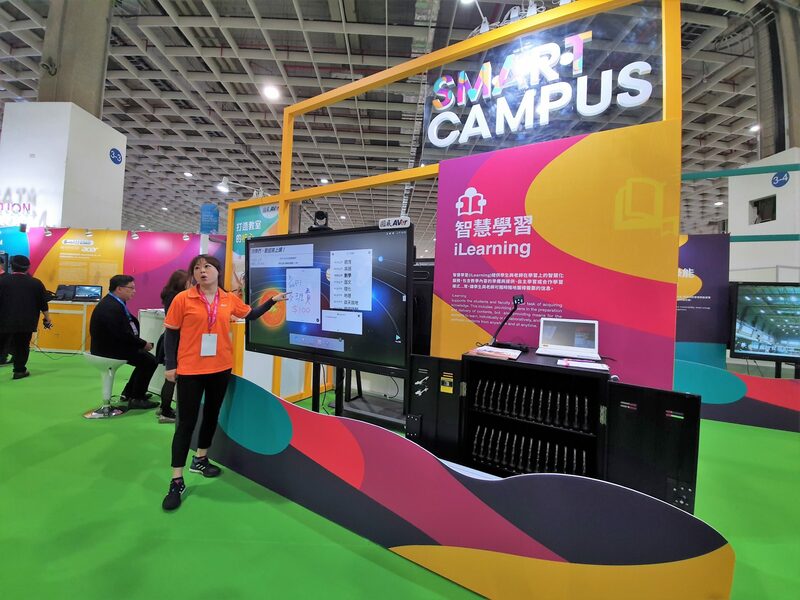 At the Smart Education Expo held at Smart City Summit & Expo Taipei, we came across many products and technologies in the education space. Ranging from educational aids to advanced image analytics systems, the vendors were very keen to share with us what they have presented. Here are the top 5 exhibits that caught out attention. Earlier, we mentioned about distant learning. HiTutor is a technology provider that simply caters for this service. It is an online based tool that brings teachers and students together via the internet. Students can see the teacher via a live video conference and speak to him/her directly, while the content being taught is shown on the screen. Interestingly, a camera also captures the facial expressions and body movements of the student and analyzes it. If the student is found to be confused, the teacher will be able to immediately respond to it, and better explain his/her concepts. That’s definitely something effective! Many educational institutes have systems in place to record videos of their lectures and lessons, allowing them to better standardize their materials. Also, students can easily refer back to the recorded videos to recollect what they have missed out in class. Moreover, with the increase in popularity of distant learning, you may not actually require to go to a classroom or lecture room to attend a lesson. Lessons can also be live-streamed directly to your PC at home. However, most of the times, the recording of lessons is done manually, and there is a need for an additional manpower to do the video recording. AVer showed us their HD Camera product which has can track the teacher’s movements and autonomously follow him/her. This takes away the need to use a remote control, or for someone else to monitor the video recording. It will certainly be useful for educational providers looking into such technologies! Many people think that computational thinking is essential to the development of every child as it teaches students how to solve problems. However, the learning curve for writing codes can be considered quite high, and it would be difficult for the younger students. Webduino is a product that aims to change that concept. As the name suggests, Webduino is a web-based Arduino platform. Webduino provides development boards for students to develop interesting solutions and learn about computational thinking. Instead of writing codes, students can make use of their web-based block programming interface to create a program on their microcontroller boards. The boards are mainly Wi-Fi enabled and can be connected to the internet. Therefore, they can also create solutions to control their micro-controller boards wirelessly. Learning aids can sometimes help a lot in the understanding of key science concepts. Simulations can also show experiments that cannot be done within a classroom environment due to safety or other concerns. This is why JTQC Digital Education developed a suit of demonstration and simulations for students to better learn about science concepts. In the image below, we can see a simulation of how a DC motor works. Moreover, the software also adds overlays to show the direction of magnetic fields, current etc. Students can also try to change the direction of the battery and find out what happens when they do so! There are more than a hundred types of setups available for them to discover. Furthermore, JTQC Digital Education even created VR mobile applications that can help students move into a virtual environment for their experiments. For an example, to learn more about the internals of a heart, the VR mobile application can bring the student close up with a virtual human heart. They then can choose between the types of valves to zoom into, and then look at how the heart pumps and blood flows through. MagicBox is a customized Single Board Computer that has a very different target segment. Understanding that 60% of the world has no internet connection, and that 1 out of 3 children in the world has got no access to education, the creators of MagicBox hope to bring a set of educational tools in the form of a inexpensive computer to these users. MagicBox will be either preloaded with Android or a customized Linux operating system. To get students started, these computers will be preinstalled with program such as Scratch (a popular block programming learning tool) and Python. While some of the solutions may seem straightforward, they can still make a huge impact to the education landscape in various parts of the world where technology is less developed. It’s also interesting to see how society is starting to understand the importance of computational thinking, and have different products geared towards teaching students how to program. Education technologies comes in various shape and sizes. We believe that as long as it can make a difference to the users, it should be considered as a good technology. Out of the 5, which sparks your interest?